At least since Hippocrates, human beings have been trying to describe and analyze the behavioral and cognitive consistencies now referred to as personality. And in recent decades, no less than in the preceding centuries, they have generated a bewildering variety of construals and constructs. In this landmark book, Jack Block, who has spent more than 50 years studying the many facets of personality, takes a long look at current debates and finds common ground on which to construct an integrative model. Perceiving more congruence among disparate formulations than has hitherto been appreciated, he elaborates his vision of personality as an adaptive system that enables the individual to maintain equilibrium in an environment that is both threatening and engaging. Taking in and organizing information and maintaining nondisruptive levels of anxiety while responding to outer and inner demands are the tasks of this system, which consists of a perceptual apparatus and a control apparatus operating in delicate balance. After presenting his model of personality, Block discusses its intellectual history and its connections to major current alternatives. He lays out some implications for practitioners confronted by dysfunction. Finally, he traces the developmental origins of personality. 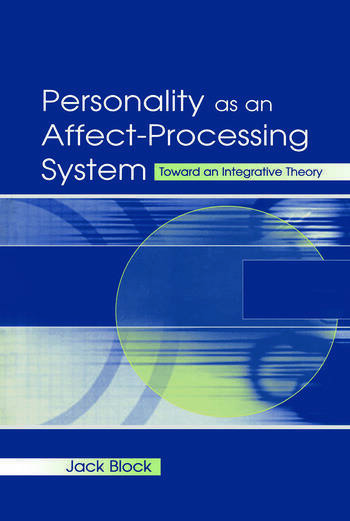 Provocative, innovative, and analytical, Personality as an Affect-Processing System: Toward an Integrative Theory points to new directions for all those who seek to understand human psychological functioning. Contents: Preface. Introduction and Orientation. Some Logical, Psycho-Logical, and Definitional Matters. Theoretical Orientation and Aspiration. A First Characterization of the Personality System. A Beginning Discussion of Drive, Percept, and Anxiety. Drives, Tension, and Control. Percept, Environment, and Perceptualizing. Closing the Ring. Clinical Implications. Connections to Theoretical Alternatives. Prescript: Developmental Aspects of Ego Control and Ego-Resiliency. "This book represents Block's attempt to integrate and expand the ideas that have stimulated him throughout his career....the book is ultimately very thought-provoking and filled with ideas that are resilient in their enduring relevance and broad applicability to the study of personality."